Looking for an easy and super quick alternative to combine multiple mpg/mpeg files? CombiMovie should fit the bill – it is small, quick and free for use. Ideal to combine those webcam and digital camera video files. 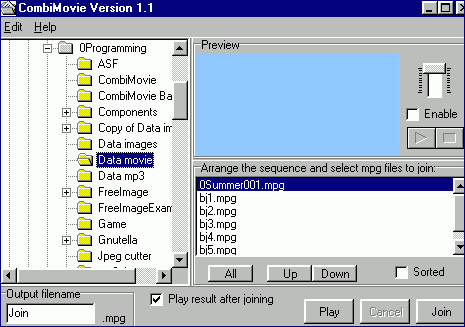 To get started just select movie files that should be combined. This application will grab the meaningful bytes and then combine specified files into one single file. Process of combining may take time if you are working with huge file sizes. Please note, this application can only combine files with the same characteristics (same dimension, compression method, color depth etc). Incase the final combined file does not play, rest assured they were not same. It only support mpg/mpeg files format. Download CombiMovie [link], very basic and quick way to combine video files.